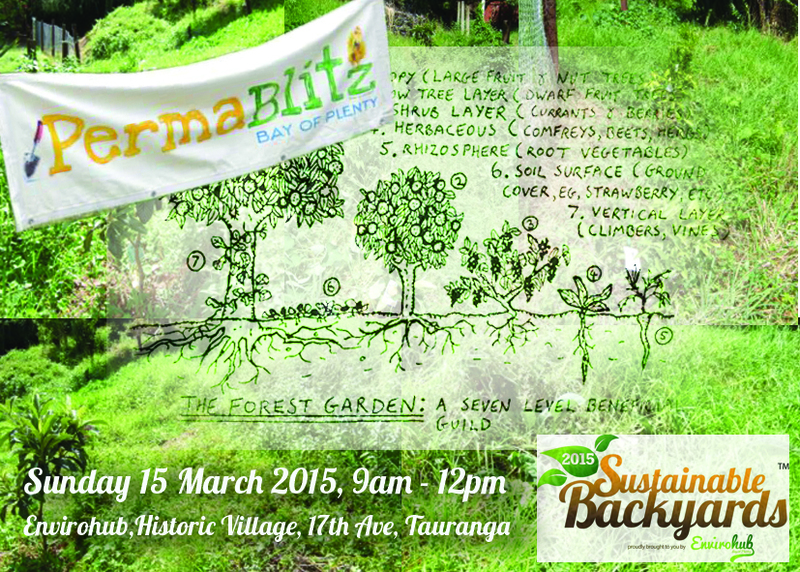 As part of Envirohub’s Sustainable Backyard month of March, the BOP Permablitz collective will be having a mini Permablitz at Envirohub’s recently planted orchard/food forest. It will be an opportunity for people who have never been to a Permablitz before to get involved and plant out a whole lot of support plants amongst the fruit trees and help turn it from an orchard into a forest. The site is a free-draining, west facing slope, so a warm and dry spot suited to a range of mediterranean and sub-tropical plants, with around 45 fruit trees including peach, feijoa, mandarin, orange, lemon, loquat, lemonade, lime, grape, fig, guava and plum already planted. First we need to tackle the rampant kikuyu grass amongst the trees and we will experiment with a variety of ways including digging trenches, comfrey barriers, and alkalising the soil (kikuyu likes a more acid pH). Then we will transplant and plant a variety of ground covers, nitrogen fixers, mineral accumulators, beneficial insect attractors and mulch-makers around the trees. Over the course of the morning, there will be a couple of workshops with Envirohub’s Noel Peterson on Moon Planting, and Plenty Permaculture’s Catherine Dunton-McLeod on Fruit Tree Guilds. There will be a potluck lunch so bring food to share. Since the site is on council land and a part of Envirohub, all participants will need to sign a health and safety form. This will automatically register you as an Envirohub volunteer to attend any future events with ease! Tree lupin, comfrey, globe artichoke, wormwood, dill, lavender, salvia, clover, yarrow, thyme, marigold, borage, calendula, tagasaste, sage, oregano, lemon balm, chamomile, apple mint, jerusalem artichoke, hyacinth bean, scarlett runner bean, everlasting pea, hyssop, chives, strawberries, sunflowers, wisteria, lemon verbena, cosmos, honeywort, mustard, NZ spinach, welsh bunching onions, tea plant, soy bean (non-gmo), goji berry, asparagus, rhubarb, licorice. To register, fill out the form below. Thank-you!